The Bay Area is home to beautiful produce, and our best chefs know it well. To this day, a dessert option at our chapel of cookery, Chez Panisse, is a fruit bowl. The archetype for desserts, the fruit bowl, has made its way into the mass-produced mainstream, and out of season, drowned in corn syrup. But chefs and cooks will stand by Alice Waters’ fruit bowl like sentinels because it’s everything those syrupy bowls aren’t: fresh, local, delicious. It’s our best produce, standing on its own, at the right time of year. Chef Judy Rogers keeps the focus on the bounty of our Bay in the introduction to her classic, “The Zuni Cafe Cookbook,” where she states, “Méfie-toi du cinéma dans la cuisine.” What she means is: beware of chefs who use unnecessary ingredients, including those that are out of season, and over fussed with in the kitchen in hopes of creating a great show because even at our most accomplished, as cooks and chefs, we can’t surpass the quality of our basic ingredients by using technique. At our fourth annual 12 Nights of Chocolate, some of the most talented chefs in the Bay Area take their skills into our kitchen and design a night with no rules except two: use our chocolate, and don’t hold back. This year, I felt Judy’s words in my bones when I saw what came out of our kitchen. Sometimes simple and always incredible food, showcasing what nature has to bring us this season, and how it can make chocolate sing. Concluding our fourth annual “12 Nights of Chocolate,” we were taken to some of the most accomplished and exclusive cooking styles in the Bay Area. There was Chef Matthew Siciliano from the brand new SingleThread Farms—an inn, farm, and restaurant in Healdsburg. Near our Valencia location is the Michelin two-starred Lazy Bear, where Chef Edward Martinez creates delicate and artful desserts. And then there’s Ramon Perez, a chef that has dedicated his career to chocolate work and produces beautifully executed truffles and bars in Sacramento, who returned for another year of his tasty creations. As a member of the pastry team, I was lucky enough to attend most of the twelve nights either as a guest, a server, in the back polishing glassware, or even helping plate with the city’s greatest chefs. The most difficult part of an all-dessert tasting menu is the sugar overload, and the guilt from a lifetime of knowing desserts for dinner isn’t the decision of an adult… but these three chefs appeased any objections we might’ve had from our mothers with flavors and textures that were seasonal, playful, and a healthy balance of technique and simplicity. 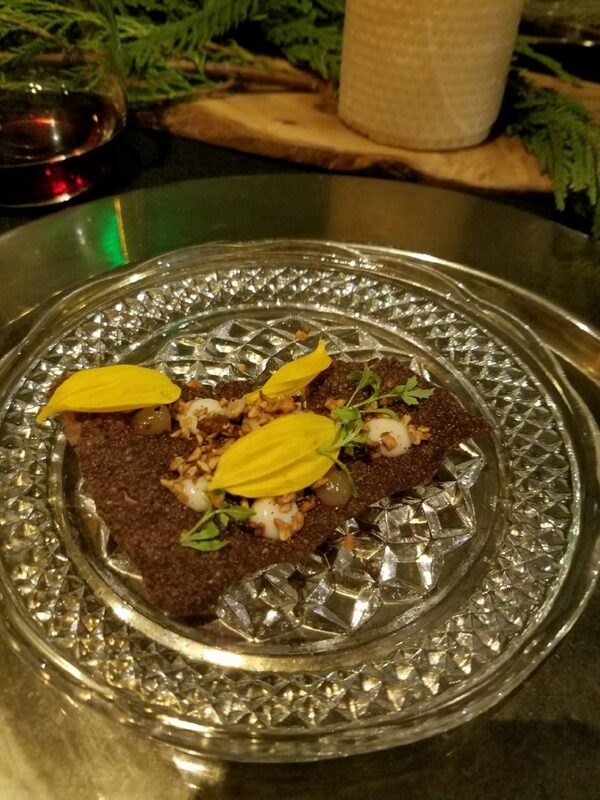 Chef Martinez started the night with a delicate brown rice cracker punctuated with drops of burnt citrus gel and cocoa nib custard. Adding to the texture of the cracker was puffed brown rice finished with petals of sunflower to add a gentle pop of color. In true Lazy Bear fashion, Chef Martinez and his cooks can be seen hunched over with laser focus, assembling each dish with surgical precision. The earthy, crisp, and tart bite was a successful beginning to the night. Our Madagascar chocolate is one of our most distinctive flavor profiles. It’s bold, with cherry and citrus notes, and a thick viscosity that keeps our tempering skills sharp. Chef Ramon Perez took this chocolate and lightened its boldness into a mousse while still retaining the tasting notes that make it so special. Sitting atop a sable-like base, the mousse round had a strip of candied pink lemon to coax out the notes of our chocolate while showcasing a beautiful but unconventional citrus that can found along some of the great stalls at the Ferry Building’s farmer’s markets. 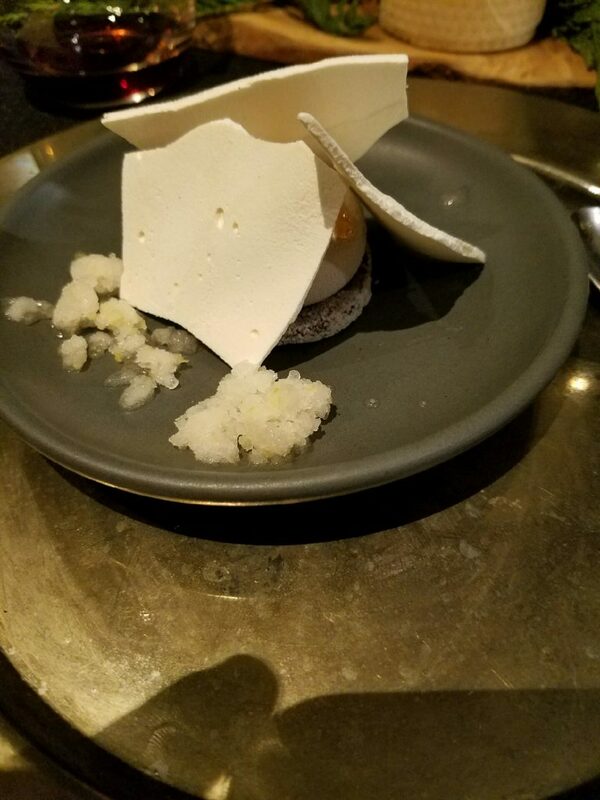 Shrouding the dessert were shingles and shards of eucalyptus meringue, over a refreshing lemon granita. 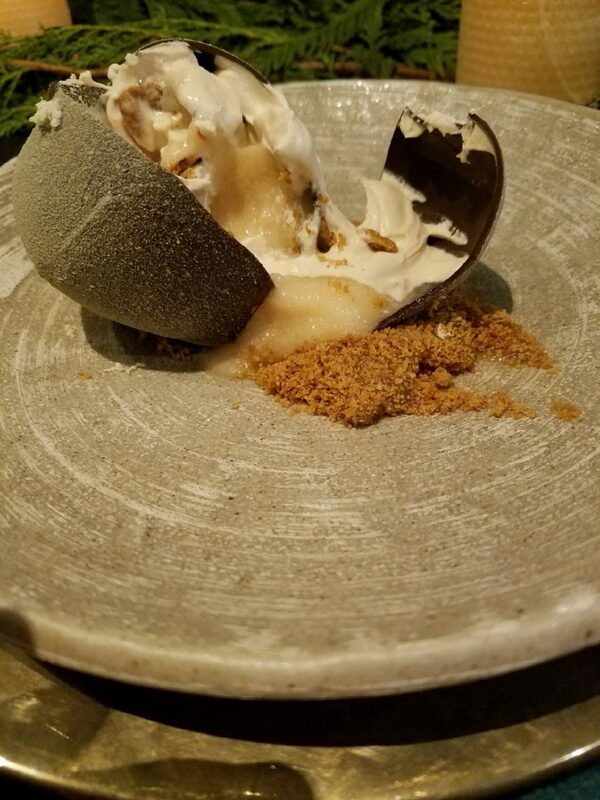 The fluff of mousse, sandy sable, chewy lemon peel, crunchy meringue, and cool granita was symphonic, and the dessert unraveled its bold nuances into one of the most thoughtful and memorable experiences our Madagascar chocolate has seen. 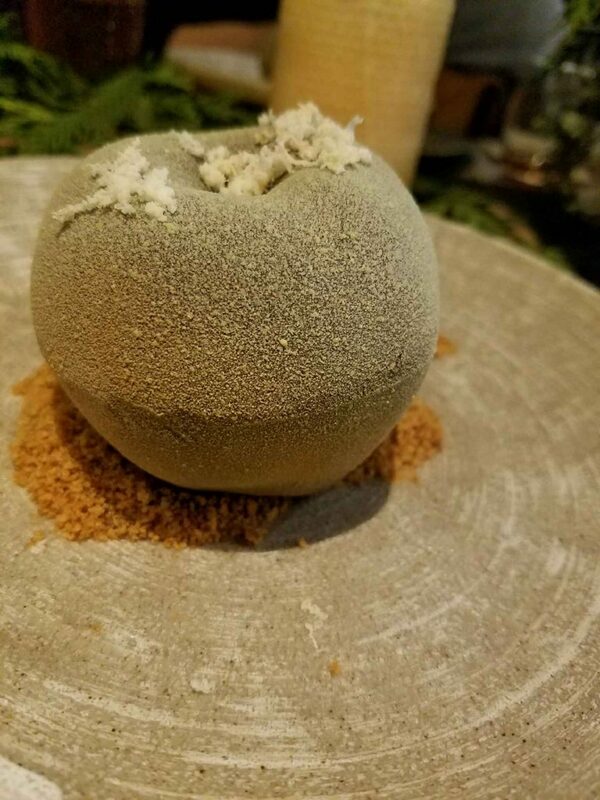 A bowl was presented with a green apple, and a simple crumble below that might look like a forgotten centerpiece on any of our kitchen islands, but on a closer look, I realized that this was our chocolate, tempered into an apple mold and dusted with green to look like a Gravenstein. I struck down on the apple with my fork and it shattered open to reveal a dream. Inside was Gravenstein apple butter, layered with a fine brunoise of Pink Pearl apple that offered a rosy color contrast. It was phenomenally impressive, the kind of thing that I could see a temperamental, perfectionist chef sweating and shouting over in the kitchen. But Chef Matt Siciliano is kind and soft-spoken, as sweet as the chestnut cream he coaxed inside that apple. It’s amazing to see how seasonal flavors can make our chocolate dance; apples, citrus, chestnut. It’s an experience of flavor I’ll never forget. With all proceeds from the nights going to the SF – Marin food bank, I can’t wait for next year when new and recurring chefs take the seasons and our chocolate to create a memorable evening for a great cause. Really enjoyed reading about this! It was wonderful being apart of the event again! I look forward to it every year!